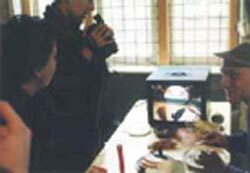 In the past thirty years I have developed a teaching method . . .
> In the past thirty years, I have developed a teaching method that defines the transition between the different art forms, primarily as a teacher at the Rietveld Academy Dep. Time Based Art. The past years I have focused in teaching about artistic research. Artistic research is aimed at the flow of ideas. In a continuous back and forth between research and design, your question yourself, others and the situation around, until the idea naturally falls on the spot. Artistic research could lead to the design of a work of art, but can also be designed as standalone product. > Getting to know your own working process in order to be able to always return to your artistic trail no matter what. Learn to upscale what you are doing to 10 or 15 years from now. Learn to downscale it to what you can do about it in the next hour. Learn about the difference between scientific research and artistic research. How in artistic research you question and re-question yourself (or the other) in such a way that the ideas start to flow. 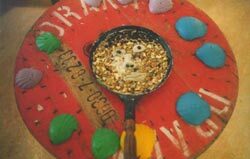 A highly practical workshop in which you visualize your work in progress ten years from now and brainstorm in small groups on what you can do in the next hour to fulfil the aims formulated in this visualization. 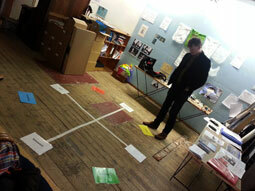 Some of the 'one hour commissions' created in the brainstorm groups are executed and presented as part of the workshop. > The goal of The Happy Presenter Workshop is to enjoy talking about your work in public and in private. Presenting should not something creepy you tend to postpone until there is no escape. Presenting can be something to look forward to. Actually just like everybody else, you are presenting all the time, even when you are alone. Once you realize that, the next step is to close the gap between your inner world and the world outside, the public. By practicing and evaluating presentations we will develop a presenting tool you can use every time somebody comes up to you and asks: 'What is your work about?' Be it your mother or a curator. Be it at an opening or at a birthday party. * Speak in public and publish about your process right from the start. Don’t be afraid to give away your idea. Trust what you do is unique. * Presenting is far from legitimizing. It is part of the very act of creating. * Better one good example then drowning in an attempt to be complete. 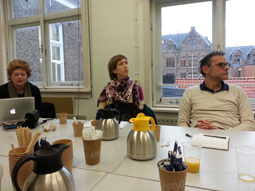 < Development new teaching formats for Academy Minerva Groningen, Lectorate Image in Context. Annual Photography Class in the PAPA method. The PAPA working method is being transferred to the photography teacher of Academy Minerva. Master class in Creative Entrepreneurship together with Bouke Boomstra. 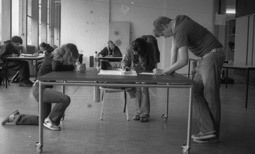 > 10 saturday classes for stichting Interart: non european artists wanting to enter a dutch artschool. > Topic: conceptual thinking. Fictive commission: design a piece of art for the railway station World Trade center in Amsterdam. 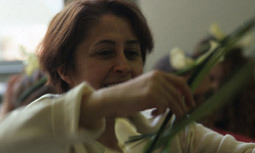 Stichting Interart started by the Iranian artist Soheila Najand organizes courses for international artists who want to get connected with the European art scene. > It is a very interesting group to teach as the people differ a lot in experience, age but most of all in premises given by the differences in culture. Soheila is doing the work as a director with her whole heart. I have never seen a celebration like this. 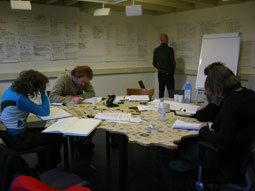 > Second phase art education in master in scenograpy - education linked to Minerva academy for fine arts in Groningen. > This is a post graduate course for dance, theatre and fine arts. 1997 sep/dec Mentor module: Together with Hein Eberson, concept and supervision of a four month course for postgraduates in different artistic disciplines. Main topics were 'Art and Daily life' and 'Staged Photography'. 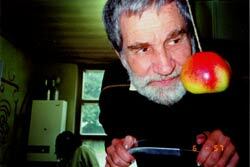 Invited teachers , among others Allan Kaprow (picture) Enrique Pardo, Richard Gough, Aernout Mik, Joep van Lieshout. 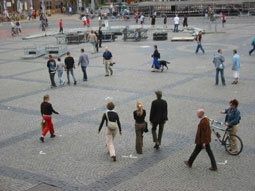 > Alkmaar, 1999. Cooking art with 13 year and older children who study to be carpenters etc.